A video has surfaced showing five clothing shop employees beating up a 49 year old woman after accusing her of stealing a packet of underwear. 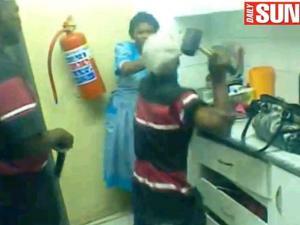 The 49 year old woman is seen in the video pleading with the men to stop beating her since they may kill her. All her cries fell in deaf ears since these men could not stop assaulting her, they even used a rubber hammer to beat her up. At that point I thought there were just about to kill her. This is just too cruel !!! !